One of the finest story teller, Ashfaq Ahmed has written quite a few plays for Pakistan Television. The subjects of his dramas are close to life and the characters very believable. 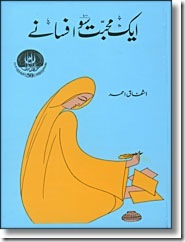 ‘Aik Muhabbat Sau Afsaney’ is once again a highly acclaimed compilation of short novels by Ashfaq Ahmed that encompasses real life situations centered on real life characters. These one are one of his early days but classic work.